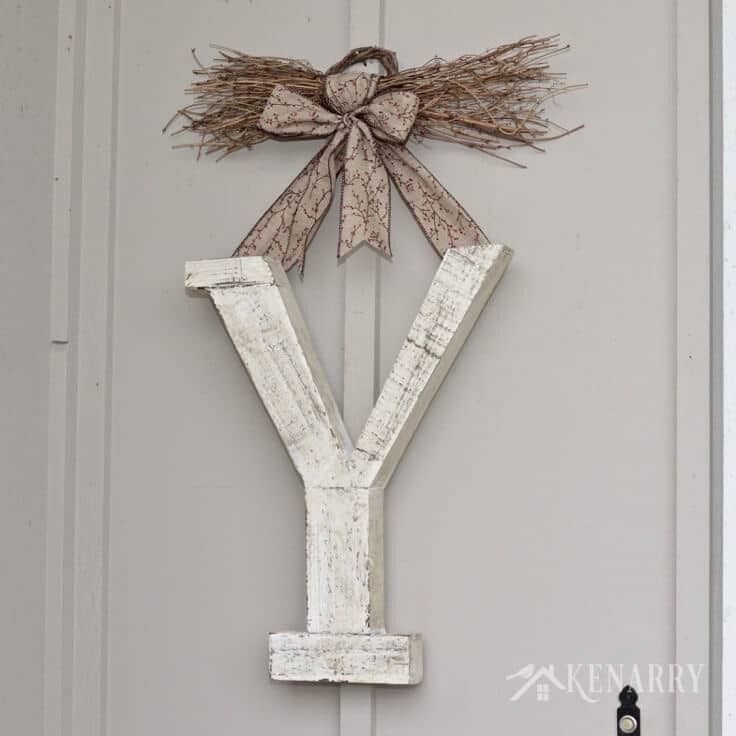 We think you’ll love this large winter monogram decor for outside the front door. It would also be a beautiful rustic idea for indoor use at home. 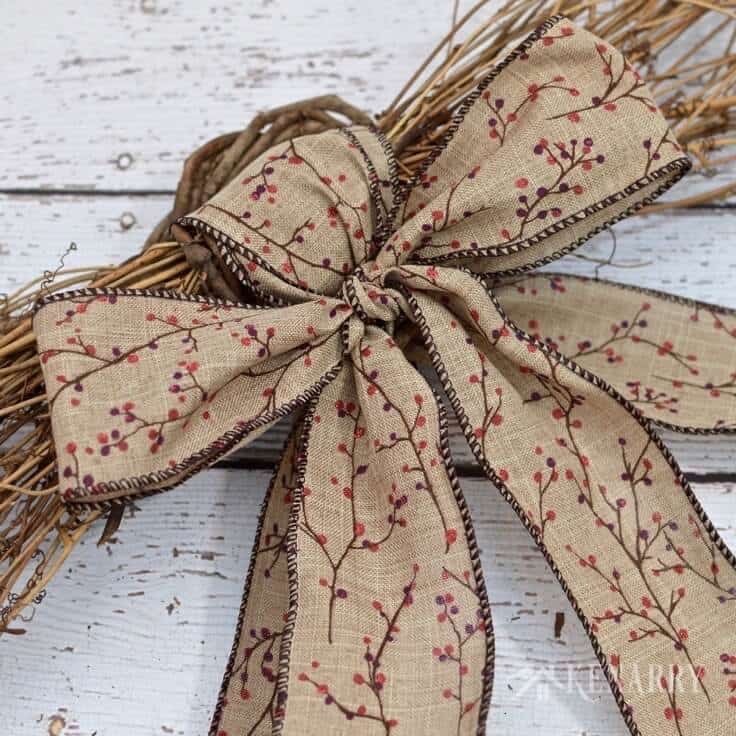 Dress up and personalize the front door of your home with Winter Monogram Decor, a large initial letter tied to rustic twig branches with a ribbon bow. When people come to visit, it’s always fun to have something beautiful to greet them as they approach your front door. Some people like to hang seasonal wreaths or other outdoor decor directly on their front door. It gives the entire home a warm and friendly appearance before the visitors even knock. At our house rather than hanging decor right on the door, we have a large space to the left of our front door where there’s a long nail we can use to display something festive and seasonal. We’ve been slowly working on creating something different for each season or holiday of the year. In the summer, we have a large orange polka dot and chevron burlap wreath. For Christmas, we have a faux evergreen wreath that we recently updated to include ribbons, beads and other embellishments. In winter, the nail has always sat bare and empty. We needed something that could handle the harsh elements of a snowy Michigan winter, so a few weeks ago our three year old and I ventured out to our local craft store looking for inspiration. It wasn’t long before we stumbled across a display of large oversized faux wood monogram letters. Each one was nice and thick, but seemed to be more of a plaster covered in a thin wood veneer making it lighter weight for hanging. I thought the creamy distressed white color would be the perfect look for winter against the taupe board and batten we have surrounding our door. 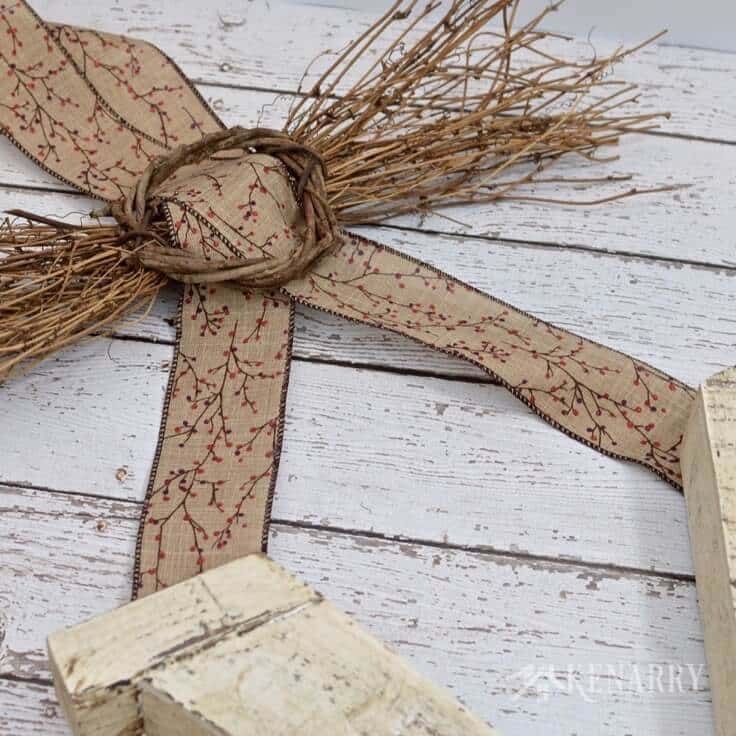 After wandering around the craft store a little more, we eventually found a wide swag of grapevine to use as the top of the winter monogram decor. I knew we had a few ribbon options at home in my craft stash to tie the two pieces together into a cohesive work of beauty. This Winter Monogram Decor is incredibly easy to make. You just need a few supplies and you can whip this together in under 30 minutes – now that’s my kind of crafty home decor! NOTE: The craft store where we bought the letter, swag and ribbon didn’t have identical products available online, so we’ve included links to similar products on Amazon and Etsy for your convenience. Large oversized monogram letter – You can likely find something that works for you at your local craft store. 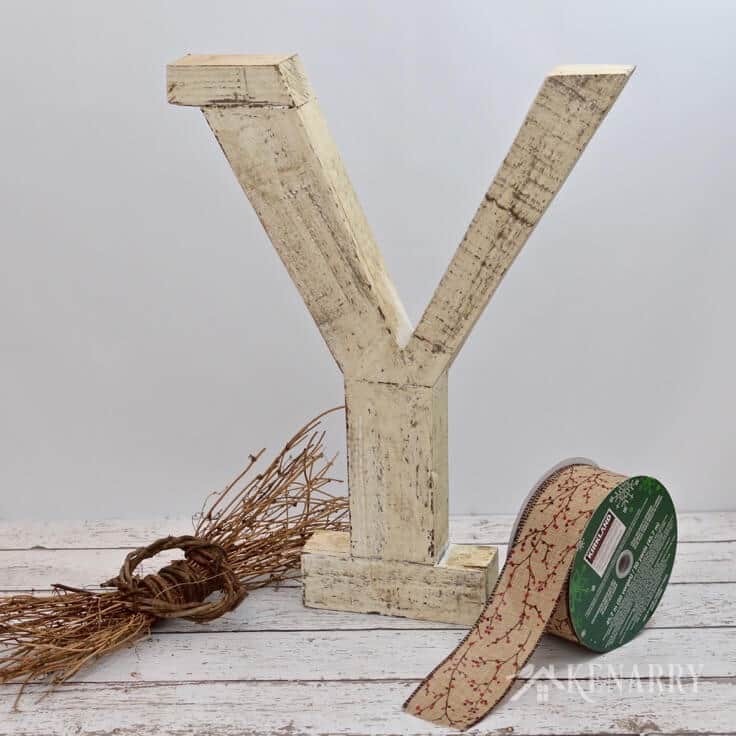 Our letter “Y” is about 20″ tall and 2″ thick. You could go with a monogram letter like this from Amazon and order it in a distressed white. Another option would be these Reclaimed Wood Letters on Etsy. You can get them 20″ tall and then just white wash them yourself to give them a distressed or winter white appearance. 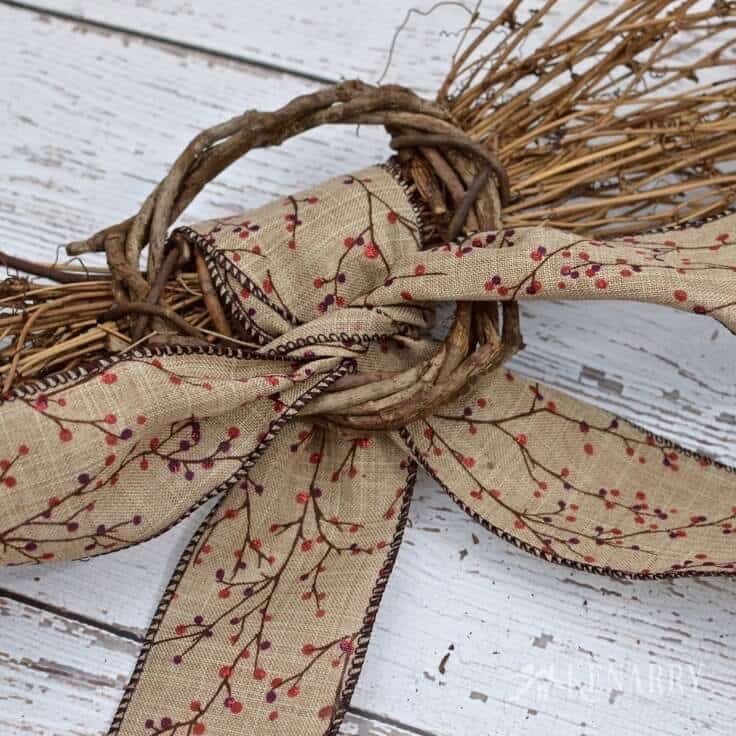 2 1/2″ wide wired ribbon – I got ours at Costco, but Amazon also has what appears to be the similar tan ribbon with red berries. 1. Cut and attach the ribbon. Roll out and cut two long lengths of ribbon. I used about 5 feet for the two sides. 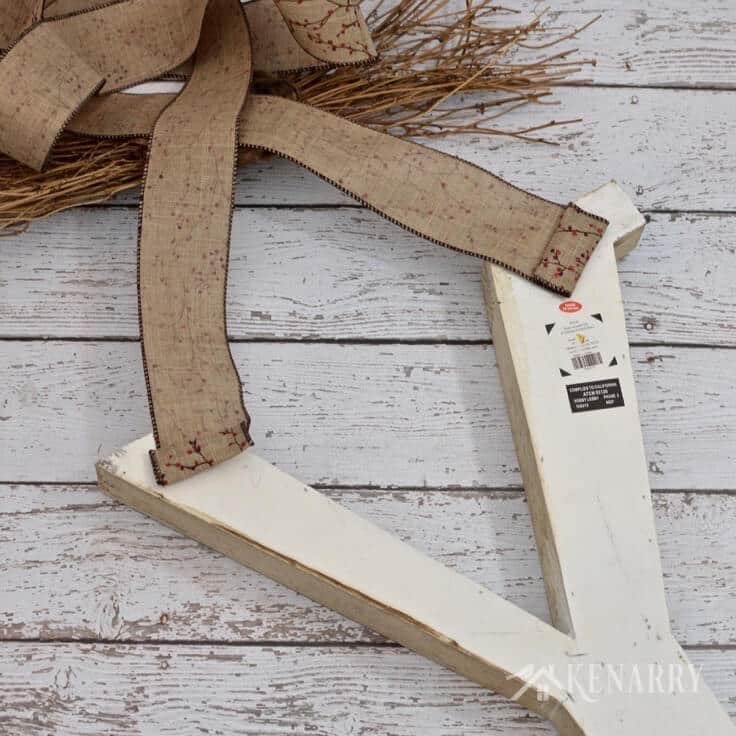 Roll the end of each ribbon over 2-3 times and use a light duty staple gun to attach it to the back of your Winter Monogram Decor at the top of the letter. Rolling the end of the ribbon a few times before you attach it will hopefully prevent the ribbon from tearing away from the staples when it hangs outside. 2. Tie the ribbon to the grapevine swag. Determine how far you want the letter to hang away from the grapevine swag and then string the ribbon through the swag like shown. Wrap the ribbon around the back of the grapevine swag, criss cross it and then pull the two ends to the front around the ribbon you already have there. Tie the ribbon in front like you would the beginning of a shoelace. Next tie the ribbons to create a bow. To keep the bow nice and straight, I first like to make two big loops and then tie the two loops together. As you do so, make sure the pretty outer part of the ribbon is what’s showing, not the back side of the ribbon. 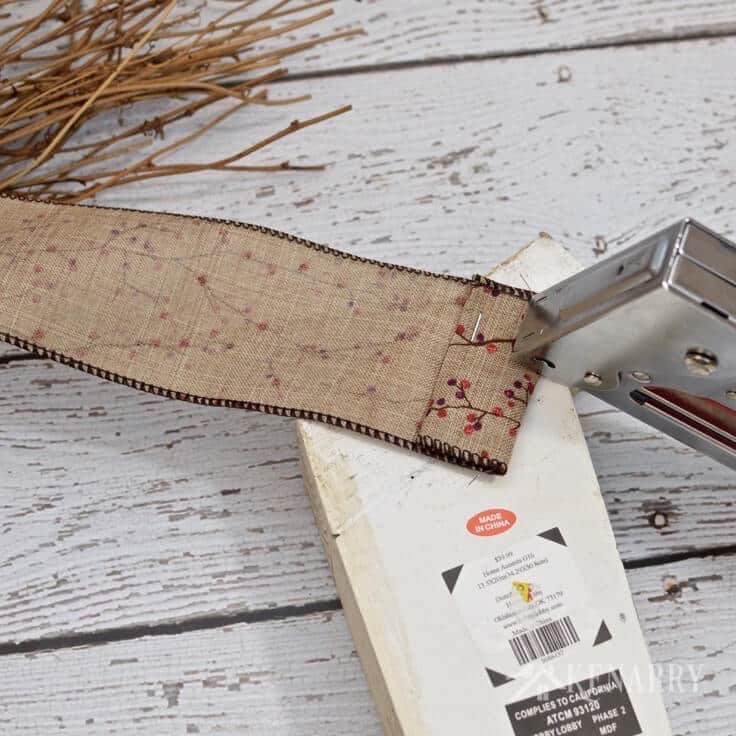 You can then trim the remaining ends of the ribbon to your desired length. 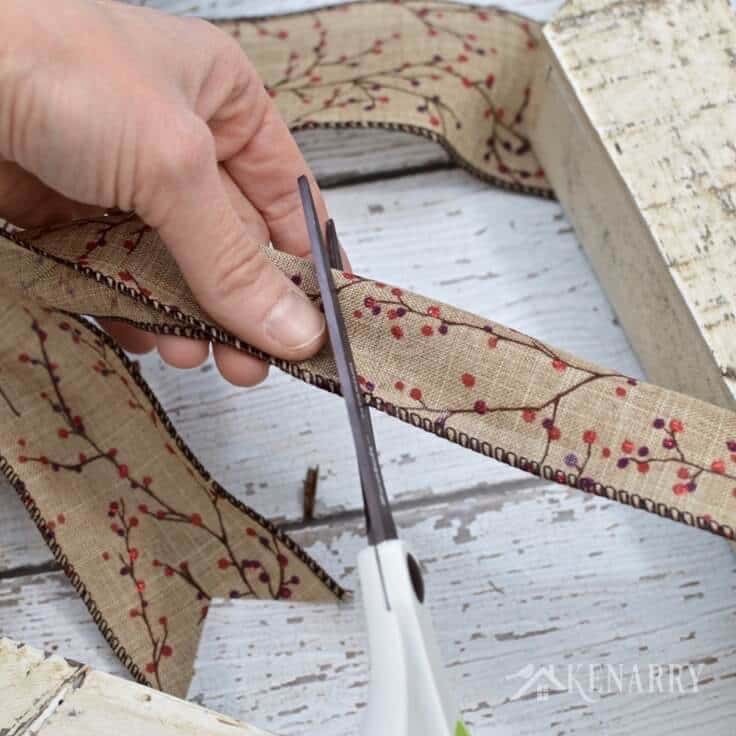 You can create a pretty decorative end by first folding the ribbon in half and cutting at a diagonal as shown in the picture below. 3. 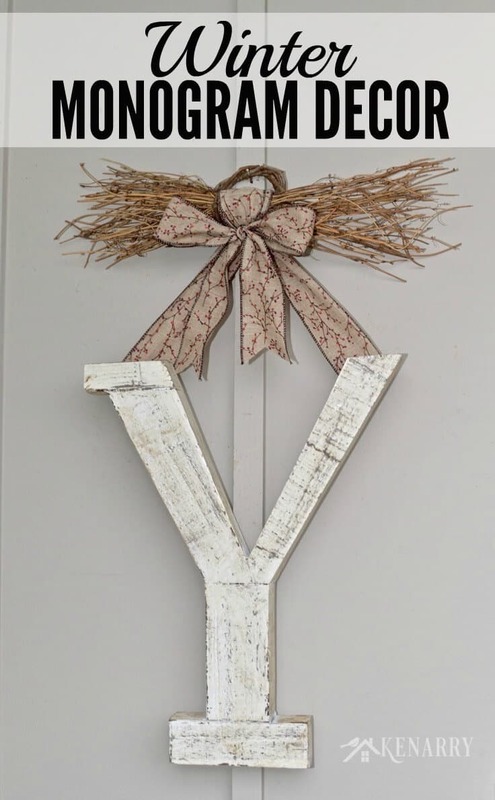 Hang the Winter Monogram Decor. Our Winter Monogram Decor hangs on a nail in the three foot board and batten space to the left of our front door that I mentioned earlier. If you want to hang the Winter Monogram Decor directly on your front door, there are numerous wreath hangers that I think would work, including magnetic wreath hangers for steel doors and suction cup wreath hangers if you have a glass window on your front door. Because of it’s size, you’ll want to make sure the Winter Monogram Decor doesn’t swing too much when you open and close the door. 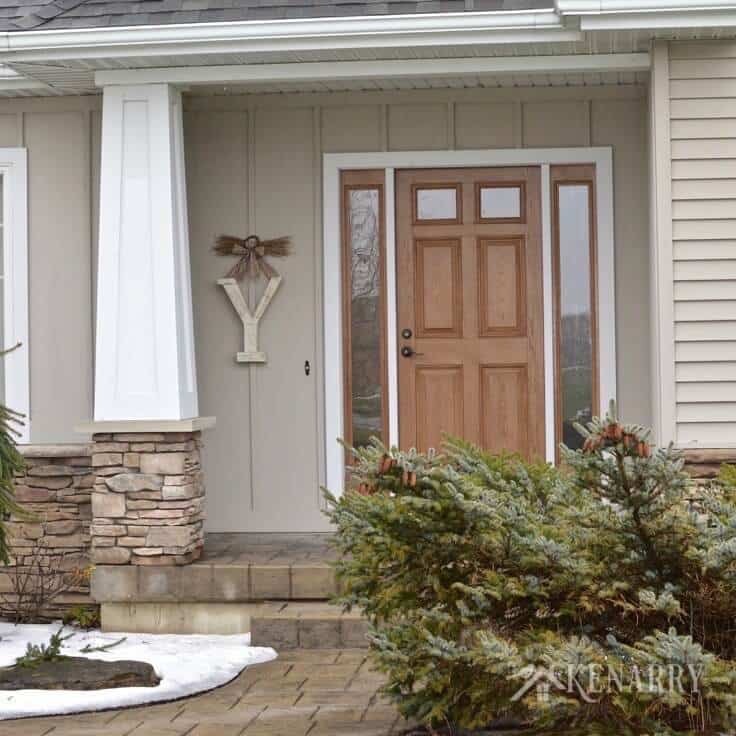 I just love the way this oversized Winter Monogram Decor looks next to our front door. It’s the perfect size for that space and the distressed white color of the letter gives it the look I wanted for winter. Of course, you could also easily hang something like this indoors, if you prefer. Now there you have a super easy and fast home decor idea you can throw together quickly this winter. Your friends will love it when they come over for hot cocoa or a warm bowl of soup. 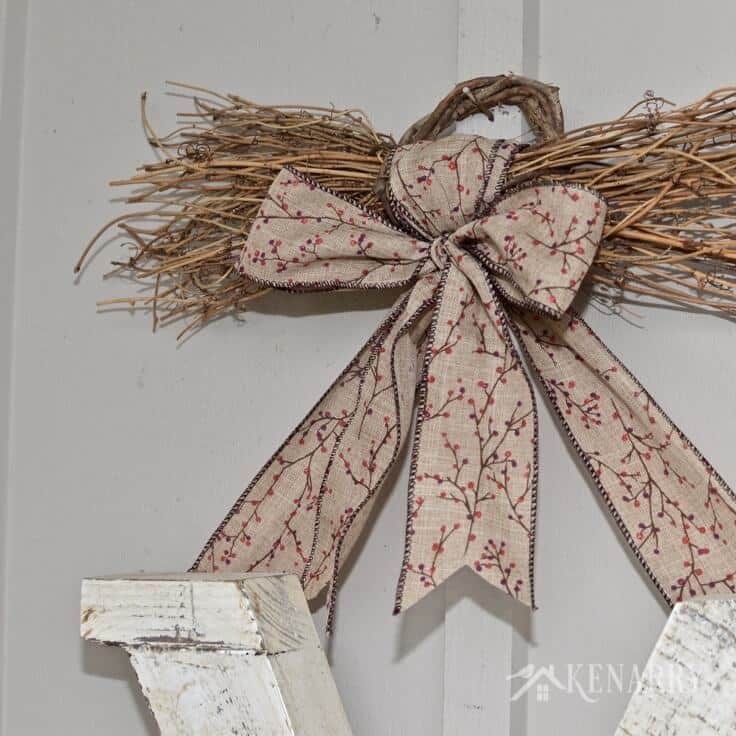 What do you hang on or by your front door for winter? Please comment below and share. We’re always looking for new ideas. Nice project, and the ribbon is perfect! thanks so much for sharing on craft schooling Sunday! Maybe as spring approaches you could add a few daffodils or some little birds! Thanks for so much, Sara! Those are great ideas for updating the monogram for spring! Love how it looks… so simple yet so pretty! Cute and do-able! Love how it looks outside your front door. We’re glad you liked it Lou Lou Girls! Thanks so much for visiting, pinning and tweeting. We always love to see you here at Ideas for the Home by Kenarry™. Love this idea. A project that could stay out all year and just change the ribbon. That’s a great idea, Beverly. Changing out the ribbon would be an easy way to update it for different seasons and holidays. Such a pretty decor piece – I love the style ! Thank you so much for submitting your project to this week’s Monday Funday Party. We’re featuring your project this Sunday! Thank you, Jen! I’m so thrilled you liked the project and are featuring it this week. Wow. We’re honored. Lisa, I’m so glad you like it. Thanks for taking the time to come over and let us know. Have a great week! Thank you, Melanie! We’re so thrilled you’re featuring our post on RTSTH!